Bernie's Dawg Blawg: "It's a great day to be a Bulldog!" With one highlight of Bill Bates flat on his back, a freshman from Wrightsville would set the bar for all future tailbacks at the University of Georgia. But more than fifty years prior to that night in Knoxville, something even more momentous happened. Daniel Hamilton Magill fell in love with UGA. And it was a love affair that spanned from the Great Depression through 15 presidential terms. Of course, Herschel would go on to be affectionately referred to as The Goalline Stalker. And it was Magill who coined the moniker. Yesterday the University of Georgia lost its longtime publicist and greatest representative. Coach Magill was 93 years young. Publicity was always Magill's forte. If carrying the football was an effortless task for Georgia's greatest running back, then carrying the torch for UGA for the better part of a century came even easier for Dan Magill. He built collegiate tennis and made Ag Hill its epicenter. He once held three jobs within the athletic offices and still found time to give free tennis lessons to local kids of the Athens community. He retired as tennis' all time winningest coach, and as amazing as that feat seems, it was just a drop in the bucket as to his impact at UGA. The greatest example of his tenacity and incredible loyalty is likely just a couple of asterisks. During World War II, Georgia's football team was depleted due to its men enlisting to fight over seas. Still, the game went on and in the rivalry with Georgia Tech we saw lopsided losses in both 1943 and 1944. The combined score of 92-0 could mostly be attributed to Tech's ability to recruit naval officers to its campus while Georgia's lettermen (ie. Frank Sinkwich, Charley Trippi) were fighting the war. So Magill had the facts added to the history books. "There's no question about it, there's no way they are true Georgia-Georgia Tech games," Magill said. "There's no question about that. We had a freshman team. "We still carry the scores, we just have the asterisks to explain the facts." So when the discrepancy in the records both Georgia and the North Avenue Trade School offer is inevitably brought up again, you can tip your cap to ol' Coach Magill. He had our best interests at heart before most of our hearts even started beating. No, no one has understood and lived out UGA Athletics like Dan Magill. Running backs have passed through Athens without ever clearing the hurdle #34 set. Probably, no one ever will. The same can be said for any and all fans of the Georgia Bulldogs. 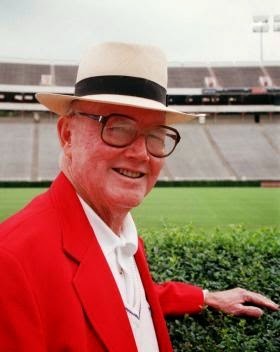 UGA will never have an alumnus greater than Coach Magill. It will never have a bigger fan and it will never have a more passionate torch bearer. If you truly bleed red and black, you understand that as fact. Because every piece of history you've come to know and appreciate, every highlight from years past, and every moment when an athlete wearing the Georgia G went toe to toe with an SEC foe, Magill was there. And he shouted "It's a great day to be a Bulldog!" No, we'll never be a greater Georgia Bulldog than Dan Magill. But we'll try. We'll always try, because that is what he would have us do.